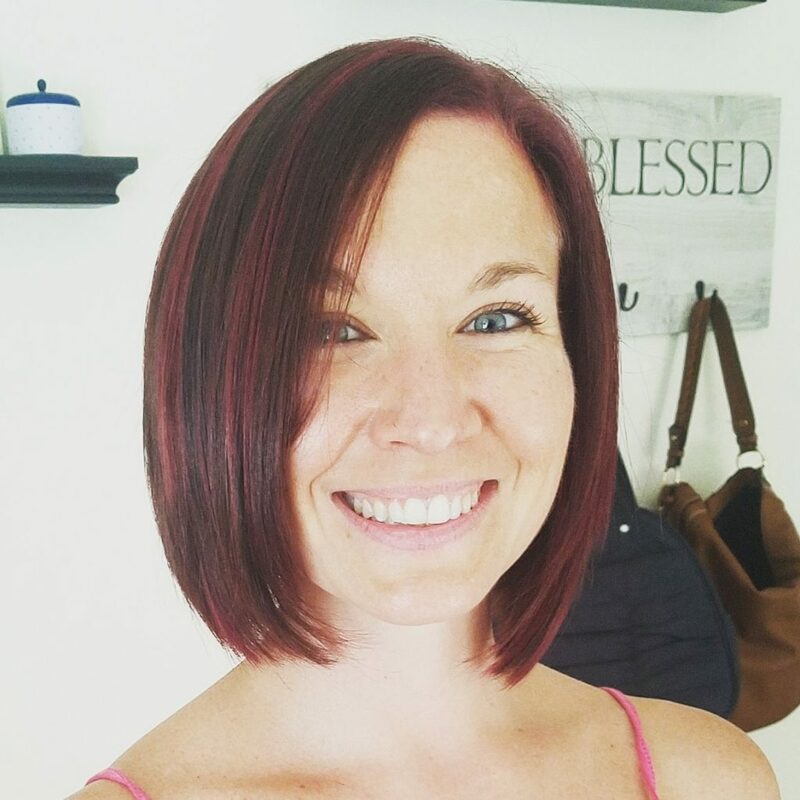 Alison of From Wine to Fine is coming up on her one year anniversary in sobriety, and I’m so excited to share this guest post! I sent her a few questions as prompts, and I love how she took it a step further to give some seriously helpful insight on living in a “soberly divided” marriage. Follow her on IG or check out her blog here for more insights into her sober life. Here’s the quick and dirty on me: I’m a wife of an Air Force pilot and mom of three (5, 4, & 2). I’m a professional high school counselor recently turned stay-at-home mom. When the stars align in my daily crazy schedule, you will find me at the gym or with my nose in a book. And most importantly, I’ve been creating a life I love – sober and free – for the last 11 months! What’s the hardest part of recovery for you? Anytime this question is asked, I immediately think- my marriage. Hands down, it’s what has rocked me the most because my husband and I are and will always be soberly divided. I’m sure most married folks would agree that marriage involves a lot of work and fine-tuning as the years stack up. Marriages must adjust to life’s circumstances like moves, kids, new jobs, family issues, losing loved ones, etc. Sobriety just happens to be one of those circumstances for us, and I fully admit it’s been the hardest hurdle yet! Drinking has always played a huge role in our relationship, which began at a bar (surprise, surprise). We drank through the courting phase, the engaged phase, the newlywed phase, and even the new parent phase. However, my husband was able to slow his drinking down quite a bit when our kids entered the picture. Me? I amped it up! When my heavy weekend drinking started to trickle into the weekdays, my husband expressed concern. When I was drinking more often while he was away, my husband gave me ultimatums to not drink. When I was drinking heavily (like the blackest of blackout heavy) the few times I went away, we both agreed I should stop drinking altogether. My snowball had full momentum, and that snowball hit its final wall in late January 2017. Prior to January, I’d tried the sober gig a couple of times- once for over 100 days and last year for almost eight months. 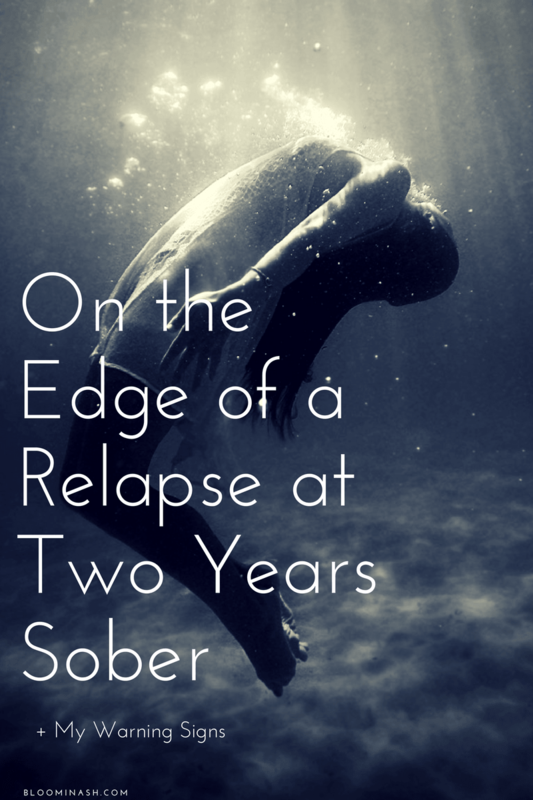 Both periods were very freeing, and I learned a lot about living life on sober terms. However, I think I always knew in my the back of my mind that I’d drink again because that’s what my husband and I did. We drank. A lot. Together. However, when I crashed and burned into my wall in January (you can find my story here), I knew something was different. I was getting sober for no one else but myself. I was sick of who I had become and was ready to live life on my own terms. Gratefully, not picking up the bottle becomes easier and easier as the days pass, but what still brings me to tears is living this new life with booze still being a huge part of our marriage. It feels like the elephant in the room a little too often. So what have we done to try to boot the elephant? Well, we’ve done a dry house, which resulted in resentment (from both parties). We’ve done a normal routine of my husband drinking as he pleases, which has also resulted in resentment and feelings of rejection (from both parties). We’ve talked. We’ve fought. We’ve tried to figure out what is best for us, but we realize over and over there is no black-and-white answer. 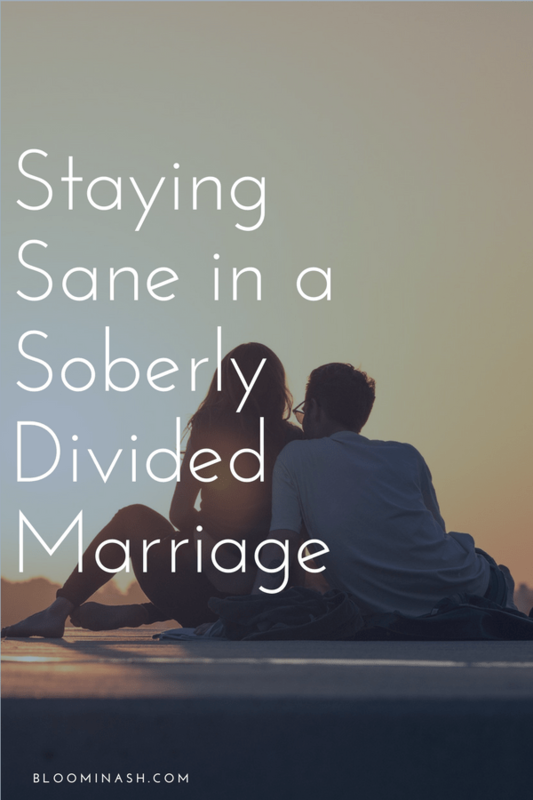 How then do you maintain sanity in a marriage that is soberly divided? Respect for one another is HUGE! My husband has slowly accepted that not every day in sobriety is roses for me. He respects this and does his best to support my mood swings. I, on the other hand, respect the fact that he is not on the same journey as me. He is a “normal” drinker and will most likely continue drinking “normally” for the remainder of our marriage. I cannot force my ways on him, nor can he force me to not embrace my sober life and all that comes with it. For the most part, I have no issues being around my husband when he drinks. However, there are times where I just don’t want to sit next to the smell of whiskey. Therefore, when I have hit my max of being around it (which usually tends to be two nights in a row), I simply excuse myself and indulge in self-care. Also, if we’re going to be out with friends, he understands that when I say it’s time to go, it’s time to GO! Or if I randomly walk away from a gathering, he fully understands that it’s me collecting myself for myself. I cannot expect my husband to understand all the thoughts and feelings running through me, so communication is vital. How can he express empathy if he has no clue that today is just not a good day for me to be around booze? How can he possibly know that I’ve been triggered and have been overcome with ugly memories of my past unless I tell him? Empathy goes a long way. Sometimes random feelings, like resentment, seem to just pop up out of nowhere! Practicing empathy towards each other is huge in these moments. I cannot expect him to completely understand why I want to punch him in the face because he’s drinking around me on my emotionally off-day. Nor can I completely understand what it must be like to be on the receiving end of my cold craziness. However, if both parties try to understand each other and work together, those unexpected moments don’t have to turn into anything more. Finding a balance that works for both parties takes a lot of work and a lot of patience. This is a lifestyle change of great magnitude for the one getting sober. It’s also a lifestyle change for the one who is quite possibly meeting a brand new sober spouse. Being kind and patient with all the changes happening will make the process that much easier. Plus, I firmly believe it will make the marriage that much stronger. 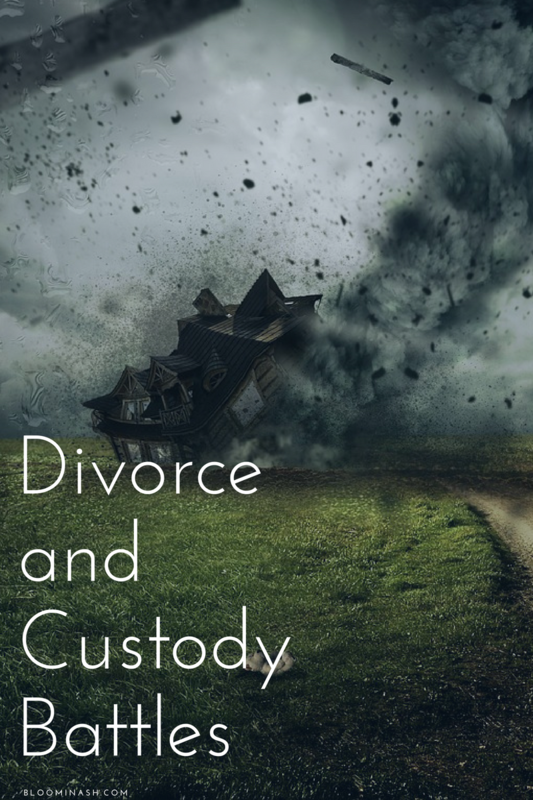 You can read more on my initial thoughts on a marriage soberly divided here. You can also follow along on my sober journey at www.FromWinetoFine.com. What words of wisdom do you have if you, too, are in a marriage soberly divided? I am in a similar situation and it is refreshing to see others out there dealing with this. Sometimes i feel like an island. 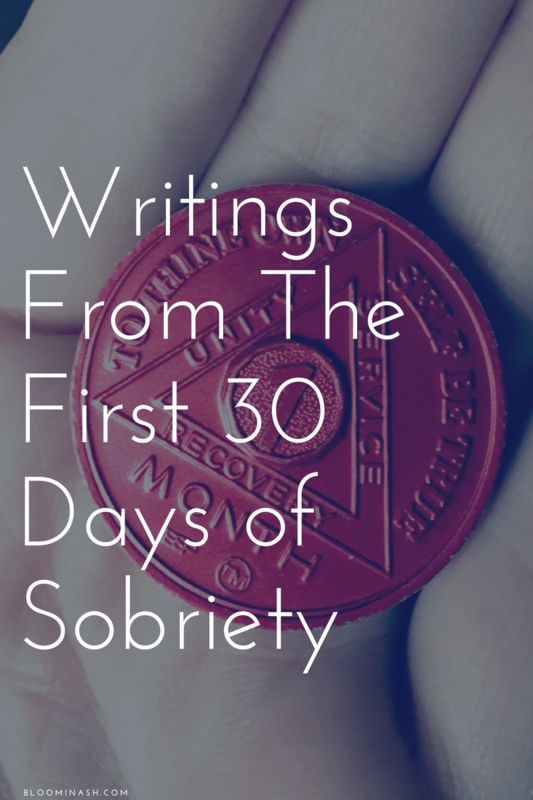 What worked most for us was for my sobriety to be a thing “we” are doing, though i am the only one sober. Lots of sacrifice and compromise, but he is my rock. When he wasn’t supportive, i failed. Thanks for the guest post. You described my situation. My husband and I met in a bar and everything we did involved drinking. Even taking our first baby to the park. We also fought incessantly when we’d bith go out and drink. Now I am sober and he’s not. Now I can’t even stand the smell of wine or beer in his breath. It’s hard but doable. We spent the last 20 years drinking together and now I’m done! Free at last! You ladies bring so much to the table. Thx Ashley for hosting Alison. And Alison you just opened my eyes to so much. My marriage was all about drinking as well and communication is key. Thank you both of you.